On page 79 of the January 2018 Edition of Modern Railways, Nick Hughes, who is the Sales Director of Hitachi Rail Europe outlines how the manufacturer is embracing the development of battery technology. Hitachi has for many years seen great potential in battery technology. We began studying on train storage energy systems in 2003. Working jointly qith operational partners in Japan and in the UK, we developed a realistic solution based on a lithium-ion battery, that could store the braking energy and reuse it for the traction. Then came our V-train 2 (nicknamed the Hayabusa), which was tested on the Great Central Railway in 2007, using hybrid battery/diesel power and regenerative charging. This was the world’s first high-speed hybrid train. This picture show the Hayabusa running in the UK. If you think it looks familiar, you are right! It’s a modified Class 43 locomotive from an InterCity 125. The locomotive; 43089, is still in service with East Midlands Trains. But without the batteries! When the remaining members of the team, who had developed the InterCity 125 in the 1970s, saw these pictures, I suspect it was celebrated with a call for a few swift halves! Nick Hughes goes on to outline the status of Battery Electric Multiple Units (BEMUs) in Japan, where Hitachi launched a train called the DENCHA in 2016, on the Chikuhi line. The train has a range of up to 50 km on batteries. DENCHA is popular with passengers. The train won a prestigious award. I don’t know what it is with battery trains, but the Bombardier/Network Rail BEMU Trial was also liked by those who rode the train. As was I! Nick Hughes follows his description of the DENCHA, with this. 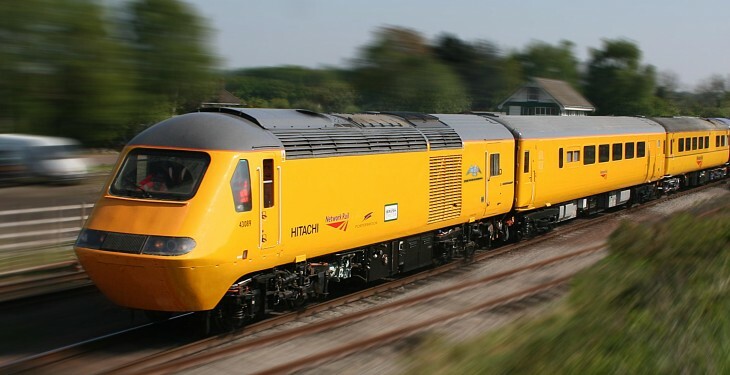 I can picture a future when these sorts of trains are carrying out similar types of journeys in the UK, perhaps by installing battery technology in our Class 395s to connect to Hastings via the non-electrified Marshlink Line from Ashford for example. This would massively slice the journey time and heklp overcome the issue of electrification and infrastructure cases not stacking up. There are a large number of similar routes like this all across the country. It is a prediction, with which I could agree. Nick Hughes finishied by saying that he believes storing power from renewable energy and the development of automotive systems will drive battery technology and its use. It is the most positive article about battery trains, that I have read so far!